Zetty Nemlowill is the marketing director at Astoria Co-op Grocery. Nemlowill is married to a fellow businessperson; Chris Nemlowill, co-owner of Fort George Brewery. The couple both grew up in Astoria, graduating from Astoria High School, going away to college, and eventually returning to their hometowns. Nemlowill has a bachelor's degree from University of Oregon in Journalism, with a minor in Spanish. She worked as a television news reporter and anchor at the NBC affiliate in Eugene. That's when her interest and education in land use and local politics began. 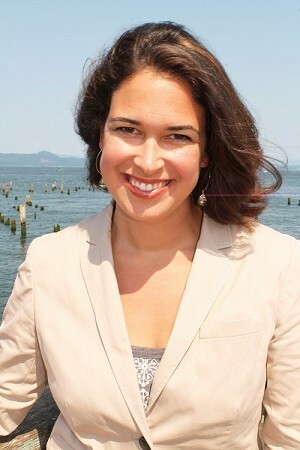 Nemlowill served nine years on the Astoria Planning Commission, including three years as President of the commission. Nemlowill has also worked in broadcast news at KMUN and KAST, and opened a business, Coffee Girl at Pier 39. Nemlowill says her most important job ever though is raising her three kids Amelia, Hudson, and Irene. Nemlowill enjoys Astoria's natural beauty (and parks and recreation amenities) for hiking, biking, running, and swimming.